The Austin City Limits Festival spans two weekends and showcases over one hundred bands, bringing local musicians and big acts from across the globe to play on its eight stages. Fans come to catch their favorite bands and to be introduced to new ones. The event is iconically Austin in many ways – not just in its support of live music but also with its high-tech planning features for the savvy festivalgoer, its green initiatives that include seas of bike racks and refillable water bottle stations, and its local food court populated by many of the city’s favorite restaurants and craft beer makers. Unlike many concerts, this one caters to kids too. 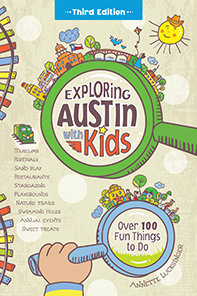 The Austin Kiddie Limits stage features rocking kids’ music and fun-filled activities. The younger set can get decked out for fun shows and dance like crazy, then take in the sand pile or the art and music activities between acts. Children age ten and under get into the festival free with a paying adult, and the kids’ stage goes until the evening. Take sunblock, hats, refillable water bottles, earplugs or earmuffs for the kids, blankets, and blanket activities (a good book, drawing pads, balls, or games). If you like to move around, bring the stroller; or set up camp with collapsible chairs and a flag or balloon to help you find your party again after venturing out. Plot out your ideal lineup, then be flexible. If you’re taking the kids, realize that how much music you see will likely depend on your children’s ages, endurance, and attention spans. Some parents get the three-day pass so they can come and go with the family and catch a couple of their favorite bands each day. Others set up camp at the kids’ stage and take turns heading over to other stages until early evening. And yet others manage a balance between family and adult shows with the help of a babysitter for the evening or for one full day. You can expect traffic and road closures as you near Zilker Park, so it’s best to consider alternate modes of transportation. Check the “Getting There” section of the ACL Music Festival website for nearby parking garages and free shuttle information. Bike racks are also plentiful, and taxis and pedicabs line nearby streets offering lifts to the festival gates. New as of 2016 is a family entrance close to the Kiddie Limits stage. Location: Zilker Park, 2100 Barton Springs Rd. Admission: Single-day and three-day passes are available. Purchase these early through the website as the event often sells out.